You may notice that this post has a little different voice than you’re used to from this blog. That’s because Kris has allowed me to introduce myself and my new role with Connecting City to Farm. I’m Rachel Logan, and recently I’ve come on board as the Director of Media for this purposeful organization. Among other responsibilities, I’m assisting with some of the social media and blog posting. I'm a photographer and delve in graphic design, so I'm helping with both our digital and print presentation. Speaking of social media, if you’re following us on Instagram, you’ve seen that it’s honeybee week. Beekeeping has become pretty personal to me because, after his retirement, my dad began beekeeping as a hobby, and at this point it might be bordering on an obsession. 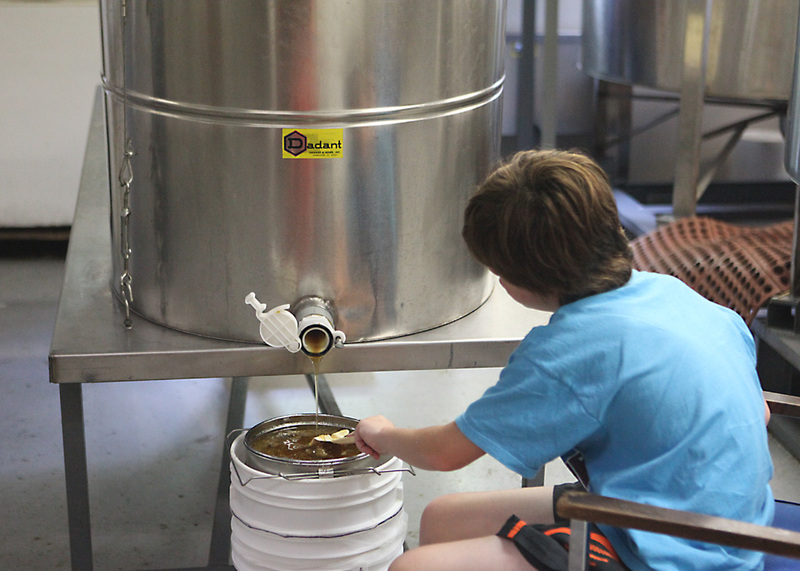 In this post, I’m going to share the process of filtering my dad’s first honey harvest. This was in the summer of 2013, and my boys look so much younger! This harvest is the result of his first year of beekeeping, when he had just two hives (I believe he now has 10). He invited us to all come and participate. It was quite a field trip, and, of course, I documented the whole process! To prepare for harvesting the honey, Dad had pulled the honey frames from the hives and had gone to a fellow beekeeper’s house to use his filtering facility. That’s the point at which we joined him, there were no bees or hives and we were just going to remove the honey from the frames with as little processing as possible. Basically, we got to be part of the reward and the fun part after months of work. The bees work for months creating their honeycombs in the frames beekeepers provide in their box hives. Eventually, they get full and are ready for harvest. To begin, the wax seal on the honey combs has to be opened. The bees sort of lock the honey in place and close it in with wax. 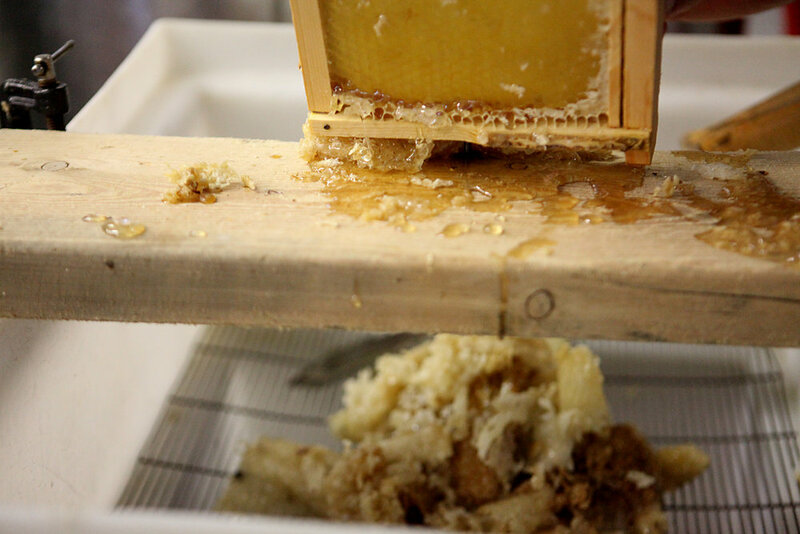 Wax removal is done with a rake like comb instrument and a hot knife the melts the outer seal of the honey comb. For a small harvest, this process is not super labor intensive, but you can understand why commercial bee keepers have a more efficient process for the volume of frames in their inventory. 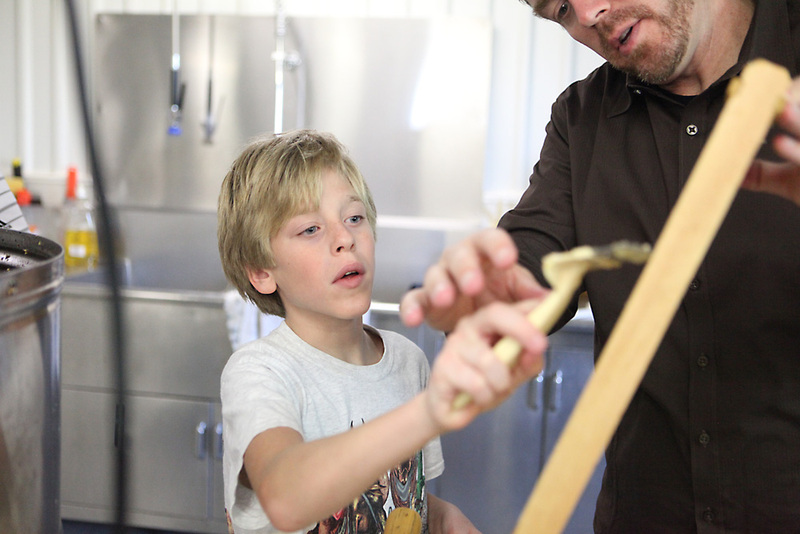 As the wax is removed from the frames, it can be collected to use for other things such as candles. It’s a very fragrant byproduct! Interestingly, we have found that cheesecloth that has been used for filtering honey makes great kindling. 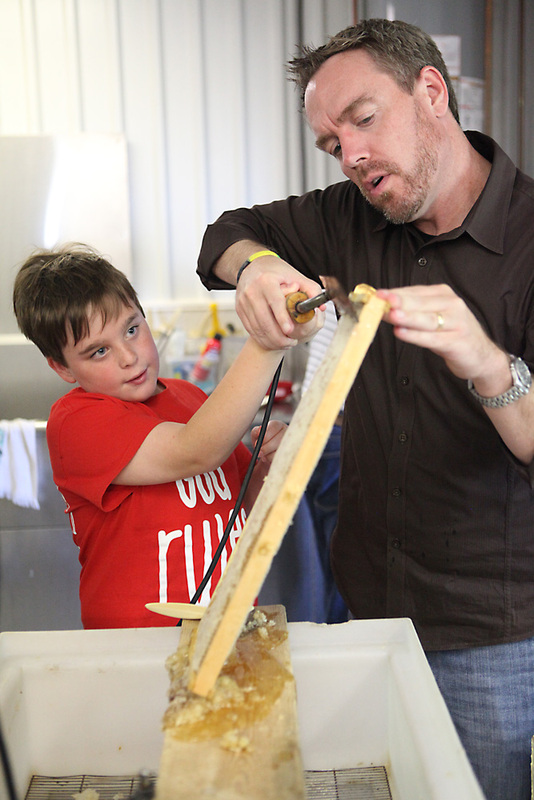 Once the honey combs have been opened, the frames are placed in a large, spinning barrel. It can hold several frames at one time. It spins the honey lose from the comb and it collects in the bottom of the barrel. 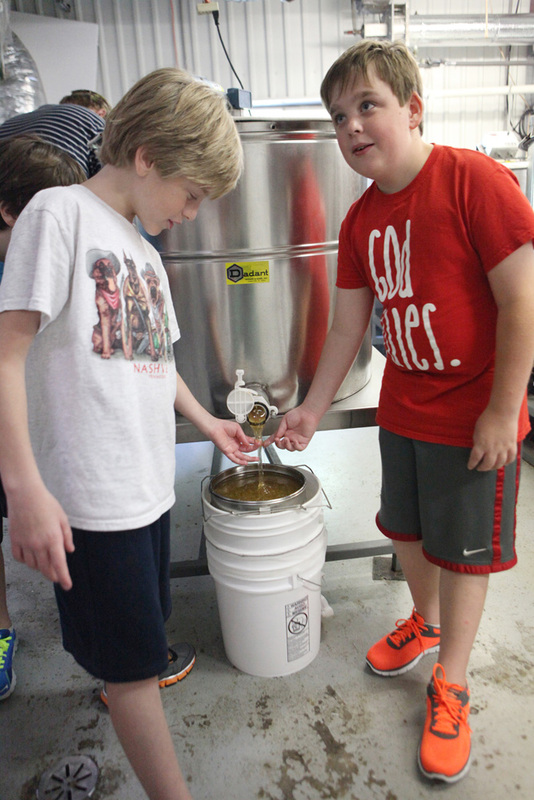 The honey can then flow from the barrel and into a strainer. 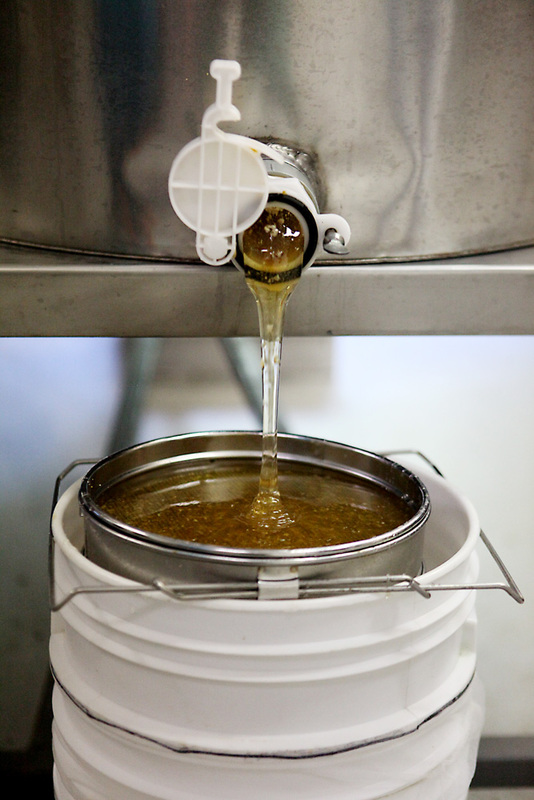 The strainer offers just enough filtering to remove any stray bee parts that might have made there way into the process. In this process, little to no heat was used and the straining is minimal, so the end product is as raw as possible. And, that's basically it! From there, the honey is ready to enjoy. It can be poured into smaller containers and will never spoil. It will eventually crystallize, but can be heated gently to return it to its liquid state. We couldn't wait and sampled it every chance we got! 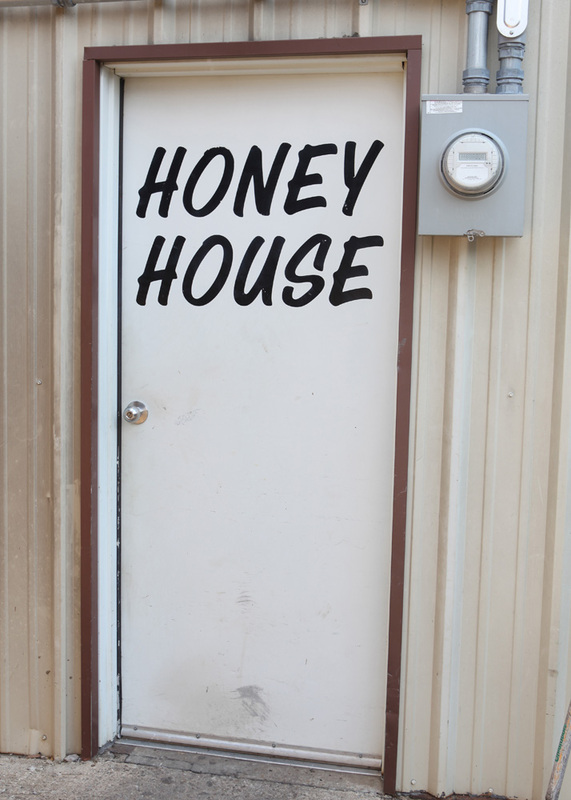 Our time at the Honey House made for some sweet memories, in every sense of the word! I hope we get to tag along on another harvest soon.